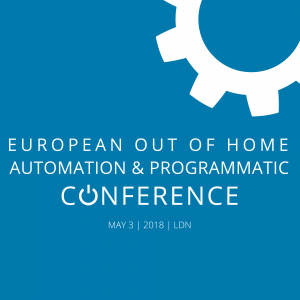 The European #OOH Automation & Programmatic Conference takes place Thursday May 3, 2018. Tickets costs GBP 195 each and you can register here. London Digital Signage Week takes place April 30-May 4, 2018 and as with its counterpart in New York, the week is for anyone involved with digital signage and interested in retail, employee communications, smart cities, digital out of home and of course digital signage! This entry was posted on Thursday, April 12th, 2018 at 00:02 @043 and is filed under DailyDOOH Update. You can follow any responses to this entry through the RSS 2.0 feed. You can leave a response, or trackback from your own site.